Birthdate: February 11, 1966 Mion is the oldest kid in Keiichi's class. As the elder, she is the class president and everyone looks up to her as the leader. Her social skills are on par with Keiichi, whom she highly respects as a friend and rival (though it is later shown that she has a crush on him). She acts like a tomboy, and calls herself oji-san (meaning old man), but has a hidden girlish side. She is next in line to be the head of the Sonozaki household, one of the Three Families which holds tremendous influence in Hinamizawa. She is often seen with a holstered airsoft gun, even though she is never seen using it, and was removed in the PS2 adaption of the game; she is, however, very adept in the use of martial arts. 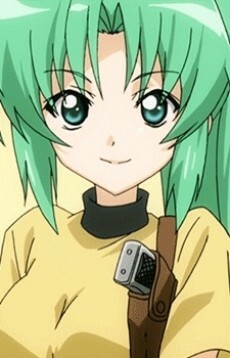 Mion also serves as leader of the after-school club consisting entirely of the main characters. She organizes a variety of strategy-based games for the members to play with penalties for any losers. Penalties usually involve wearing embarassing or frilly outfits on the way home. Each game she organizes involves bending the general rules or using questionable and crude methods to win such as playing cards with a marked deck or using feminine wiles to discourage opposition.